When we started out, our lack of traffic threatened to crush us. Here’s how we fixed that. 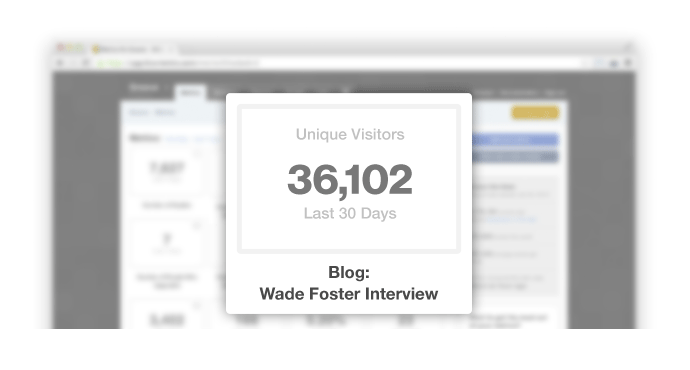 That’s how many unique visitors we had in the first month after we released Groove. 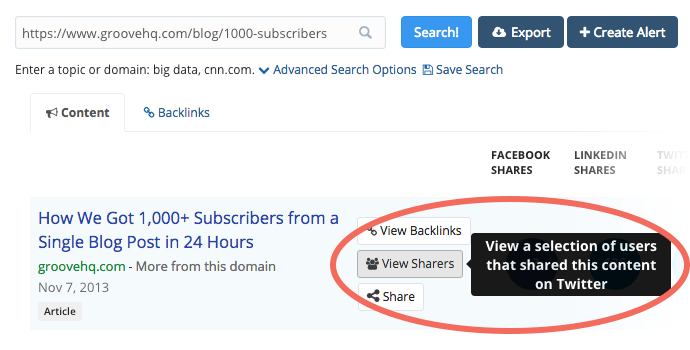 It’s not bad if you’re launching a new blog and want to share your thoughts with a small group of people. Well, at 1,000 visitors a month, you’re probably screwed. At least we would’ve been. It wasn’t a fun time in our history. And we tried everything we could think of to get more people to groovehq.com. A lot of it failed. But some of it didn’t. And what actually worked—the tactics that finally drove real, high-quality traffic to our website—fueled the growth that we’ve accomplished over the last couple of years. Last month, we clocked in at 120,240 unique visitors. A 12,024% improvement over where we started. And not a single one of those visitors got to our site through an ad. 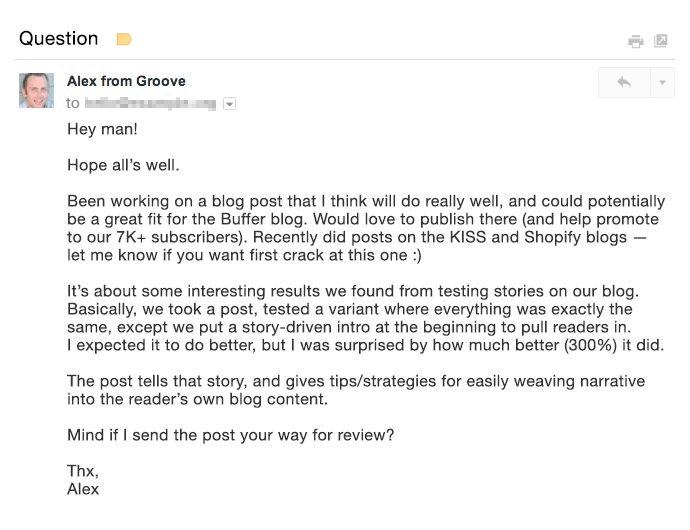 One of the first things we did when we started marketing Groove in earnest was to try and drive traffic from as many sources as possible. Admittedly, this wasn’t a strategic move at the time. In fact, it was a big mistake that ended up paying off handsomely. The mistake wasn’t casting a wide net, but thinking that this approach would be successful in the long term. We had planned to pursue our overreaching efforts indefinitely. Ultimately, what we ended up with was a reasonably wide range of traffic channels with varying levels of success. Our blog—this blog—turned into our biggest driver of traffic fairly soon after we launched it, but not without a lot of work in the background. Most importantly, the blog was an early success because we didn’t take the common “publish and pray” approach. Instead, we spent many hours building relationships with the influencers who would end up being the launchpad for our first serious traffic numbers. Much of that initial burst came from a couple of key pickups around the web and the traffic died down by around 40% the following month, but our launch helped us build a sustainable baseline level of traffic that would fuel our growth for many months to come. 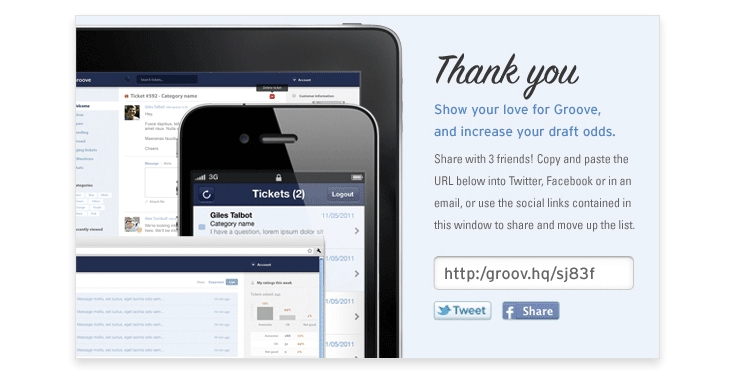 In the early days, we had grand plans of Groove being adoringly covered by TechCrunch, Mashable and the like. We built a pitch list (get the full list here) of more than 40 top tech blogs, and we emailed every single one with—what we thought was—a strong pitch. Our 20 or so hours of work on the project netted us exactly one piece of coverage (though not until a friend of mine pinged the publication about Groove on Twitter after I had emailed them). Still, it was a press hit. And it lead to a few thousand visitors to our homepage in the earliest, most traffic-starved days, so we were thrilled to have it. 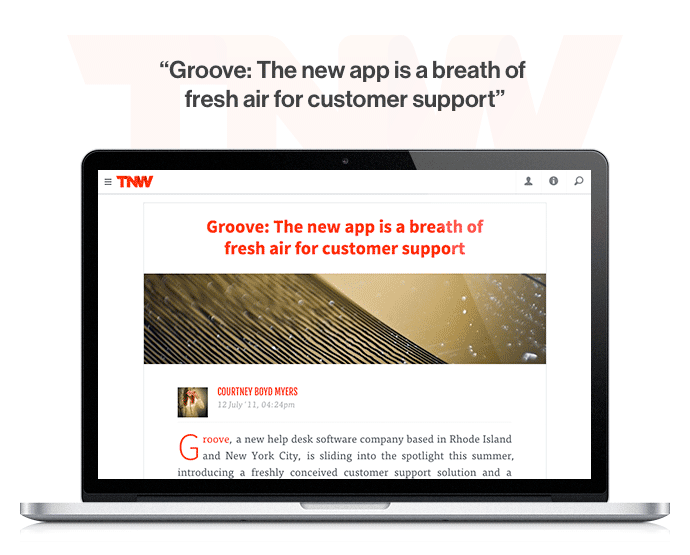 I was an avid reader of Hacker News, and so naturally I wanted badly to have Groove featured there. It took a lot of research, but we learned the rules of HN, put together a strategy for hitting the front page, and set it in motion, recruiting one of our influencer friends to share our post on the network. And, we promptly failed, slipping off of the front page within minutes and getting buried several pages down. But, through either luck or coincidence, several hours later our post found itself back on top! Except that it wasn’t because of anything we did. Another reader had submitted the post, completely outside of our efforts. 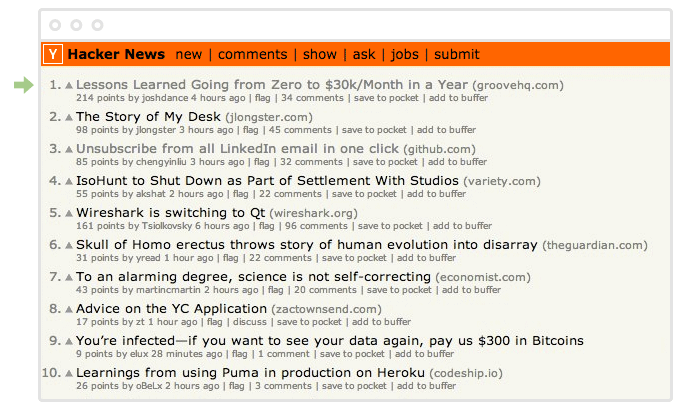 And so we failed our way to #1 on Hacker News. Still, the “fail” drove significant traffic, and our numbers looked great the following day. Future posts featured on Hacker News all continued to drive traffic, though it hasn’t been a focus for us (more on that below). Another big source of early traffic for us was guest posting on blogs that already has established their audiences. That pitch turned into this post. You can find more about our strategy for guest posts here. It’s a strategy that continues to be part of our overall approach. Another channel we tried to attack early on was getting Groove listed in various app marketplaces around the web, places like GetApp and Pandia. We didn’t have a well-defined strategy here, but we submitted Groove to as many marketplaces as we could find, and tried to keep our listings as up-to-date as possible. Ultimately, the traffic numbers that we got from this effort were low, and the quality of the leads wasn’t terrific, either. Still, I’m glad that we tried. 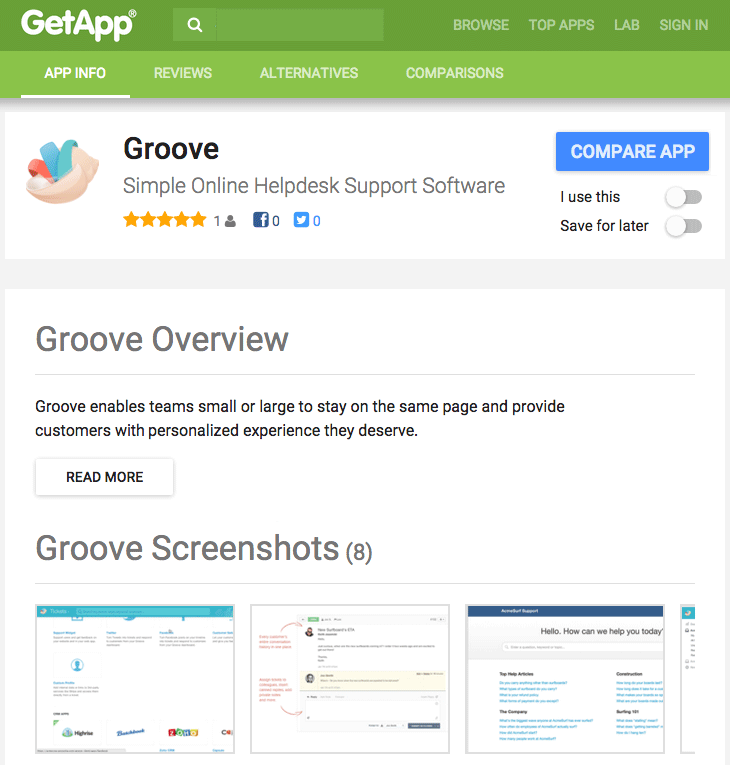 From the very beginning, we knew that our customers would want to use Groove with other business apps that they were already using. And we knew that integrations could also be a source for new customers. So from the start, we paid careful attention to the integration requests that our customers had, and tried to identify opportunities for high-value partnerships. We’ve had some flops with very little adoption, but overall, our big successes — integrations like Slack, HipChat and Olark — have more than made up for the misses, with long-term traffic gains and high-quality leads. You can learn more about our process for partnering with other companies and creating successful integration launches here. In an effort to drive more traffic, we’ve tried to build sharing functionality into the app from the very beginning. We’ve also shared our blog content through Twitter, and built relationships with our readers and influencers by responding to questions and sharing things that we think would be valuable. Social media traffic hasn’t been a slam dunk for us, but it brings something. Soon after we launched, we tested adding a “Powered By Groove” link on our customers’ support widgets. While I was scared about customer backlash to this test, there was virtually none, and we’ve kept the feature. It drives a small number of visitors each month, but the quality of the traffic is high. 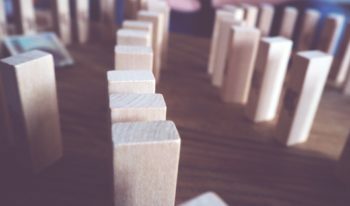 While we were quite late to the party on SEO (for a long time, I was under the “all SEO is scammy” delusion), we eventually began to put in effort understanding how to improve our organic search traffic. Cursory keyword research using Google’s Keyword Planner and Keyword Tool to figure out what people were searching for. Working those keywords into pages around our site, and building some additional landing pages to convert targeted search traffic. Our SEO process was outlined in this post, and although the results weren’t immediate, we soon began to see not just a spike in organic traffic, but big wins on the conversion side as our traffic got more and more targeted. We also began to implement our SEO learnings on our blog. I didn’t want it to change my writing style or compromise the quality of our posts, but we implemented it in little ways like our titles, subheadlines, links and meta descriptions. 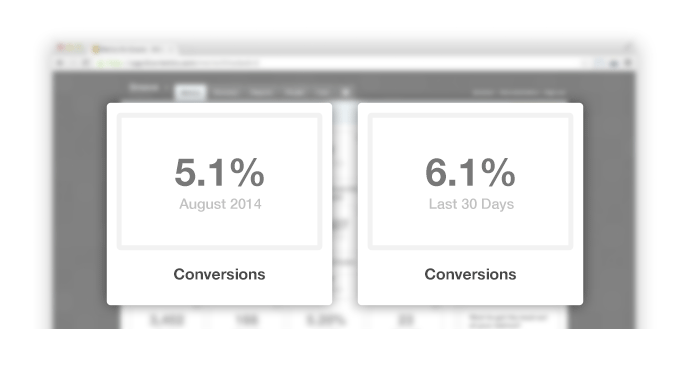 Takeaway: Don’t be afraid to try many different channels to drive traffic to your site. 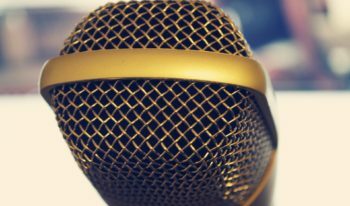 Expect that some will fail, but expect that casting a wide net will help you identify which channels are most effective for your unique audience. There’s a good chance that your findings will be very different from ours. After several months of unfocused experimentation, it was time for us to work to understand which channels would be our “bread and butter” moving forward so that we could double down on them. To get a rough determination of each channel’s potential, we evaluated them based on the effort/time required, quantity of traffic and quality of traffic (i.e. 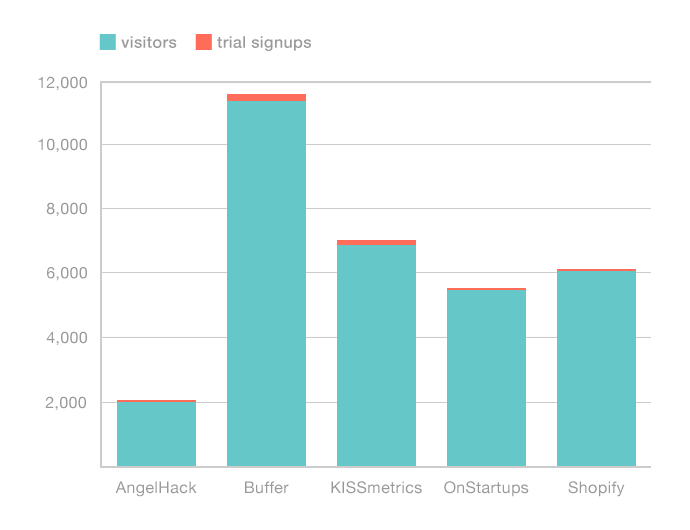 how likely the visitors are to convert to paying customers, a calculation we got from simple funnel tracking in KISSmetrics). Note: the values here are based on our own approaches to each channel. Yours may be different. For example, it’s possible to put a ton of time and effort into social media (and get much better results from it than we did). It’s also possible to spend less time on your blog (with, in my experience, less positive results). From there, our plan for moving forward was going to be based on prioritization and bandwidth. What was worth pursuing, and what would we actually have time and resources to accomplish? Unfortunately, limited resources played a big role here. If we had a big venture-funded war chest, we’d have a development team focused full-time on cranking out integrations with high-value partners. But that’s not the path we decided to take, so we can’t do that. Guest blogging: While we’ve scaled down the effort a bit to spend more time on our own blogs (more on that below), we still pursue this channel. SEO/Organic Search: Another no-brainer. If we were going to be publishing content anyway, we might as well put in some effort to get more value from that content. Third-Party Integrations: We don’t spend nearly as much time on this as I’d like, but that’s reality when you need to keep your development resources tightly focused on making your product better for existing customers. Still, we try to release at least one integration per quarter. Social media: We monitor mentions, have conversations with customers and readers and post new content. We admittedly do the bare minimum here. HN/Online Communities: We ask our friends to post new content to communities like Hacker News and Inbound.org. In-Product Referrals: We maintain our “powered by” link and other similar referral links. Everything that didn’t fall into one of these two categories was cut. Takeaway: Traffic is only valuable insofar as it brings you customers (and ultimately, revenue). Once you’ve figured out which traffic is the most valuable to you, focus relentlessly on driving more of that traffic, and eliminate any significant time spent on lower-quality traffic. After having gone wide to figure out which channels would work best for us, it was time to deep on those individual channels; to understand them better and learn how we could drive even more results from each one. We spent hundreds of hours doing research and talking to experts, and we were able to make huge strides in each of the four primary traffic channels we prioritized. While our blog drove a lot of traffic, we had one big problem: most of that traffic was never going to convert into Groove customers. 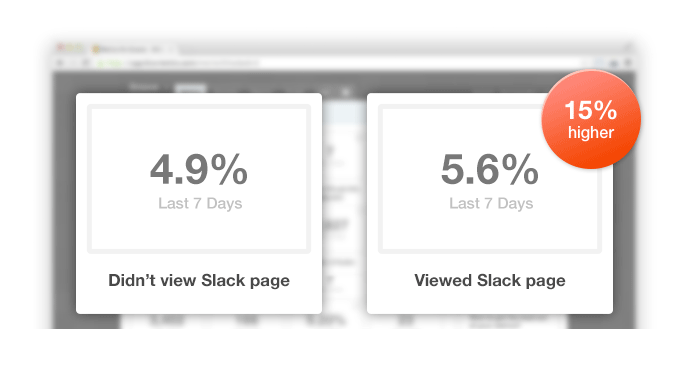 It filled the very top of our customer acquisition funnel with readers who were interested in growing a business, but very few of them were immediately interested in customer service software. It became very clear that in order to get targeted traffic that was already close to customer service software buying decisions, we’d need to actually write about, well, customer service. And so that’s what we did: last year, we launched our customer support blog where Len shares weekly posts about customer service strategy, increasing retention, decreasing churn and other things that people in the market for support software care about. The support blog has been a big success in a very interesting way. From the outside, the support blog gets far fewer comments and shares than this one. But because of the organic search success of the support blog—it ranks very highly for some incredibly valuable support-related search terms we’re targeting—after less than a year, it already gets around 60% of the traffic that this blog does. And the results continue to compound. For example, the blog’s most popular post (about customer service email templates) brings in more than 12,000 unique visitors each month. 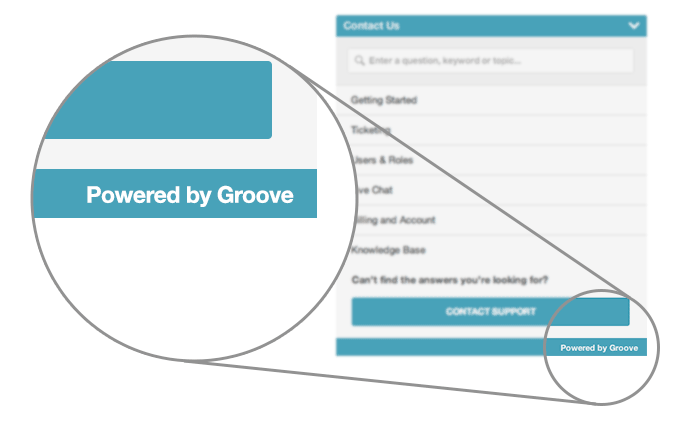 This traffic is often decidedly toward the bottom of our acquisition funnel, as many of the readers already have an active interest in delivering better support; the only thing left for us to do is to convince them that Groove is a great way to help them do that. 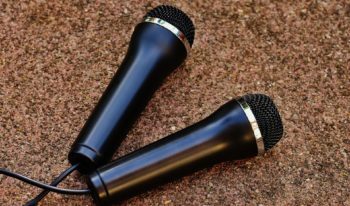 We’ve also doubled the frequency of the content on this blog, from one to two posts per week, with the addition of the Friday Q&A series, which also continues to pick up steam. Takeaway: Don’t just write content that’s interesting to you. When you’re writing, think about the mindset of the reader you’re writing for, and where in your acquisition funnel they might fall. If you’re focusing too much on filling the top of your funnel, consider diversifying your content to get more high-quality traffic. Conversely, if you’re targeting the bottom of your funnel but aren’t getting high traffic volume, consider some content that could help you fill the top of your funnel and boost your SEO rankings and awareness of your brand. While we’ve continued to publish guest blog posts, we found that the returns from guest posts diminished slightly as our own audience got larger and more engaged. And so we thought about how we could still harness the biggest benefit of guest blogging—leveraging other influencers’ audiences—but drive even more traffic to our own site. 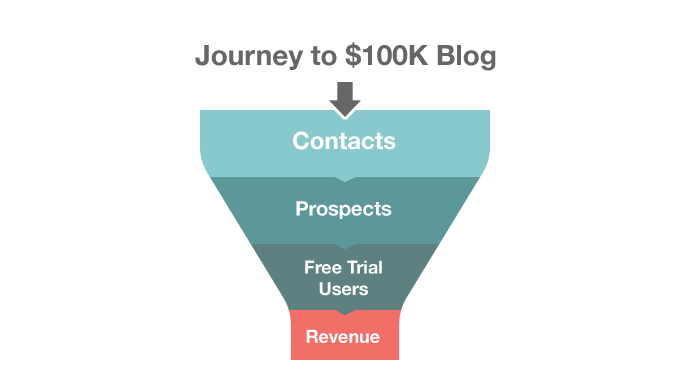 What we came up with was our biggest traffic win of the past few months: our My First $100K Interview Series. We started publishing interviews—on our blog, not theirs—with influential entrepreneurs. Our goal with each interview is to make it the absolute best interview ever published with that particular founder. Because of that, the entrepreneurs are more than happy to lend the marketing muscle of their own audience (as well as that of their companies’) to help promote the content and our blog. What we’re left with is the best of both worlds: the powerful impact of exposing our content to entirely new audiences, and getting to keep the content and traffic on our own site. Takeaway: Guest blogging is a powerful tactic, especially early on when you’re working to build your audience. But think about other ways to leverage influencers’ audiences that can drive traffic, too. Interviews and round-ups are great methods to accomplish this, but as with many things, quality matters most. 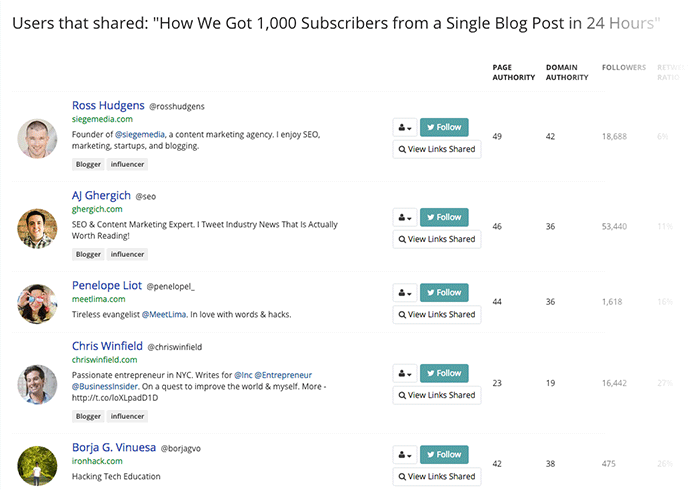 The difference we’ve seen in engagement on posts where we simply publish a Q&A-style interview, versus those where we take the time to extrapolate and tell a cohesive, interesting story about the founder, has been massive. We’re actively working right now on a ground-up examination and rebuild of our SEO strategy to help us optimize our results even further, but we’ve had some big wins in the meantime. The biggest one has been building more non-obvious (to me when we started this effort, anyway) landing pages on our site to capture targeted search traffic. Perhaps the most powerful example of this has been our Alternative landing pages. 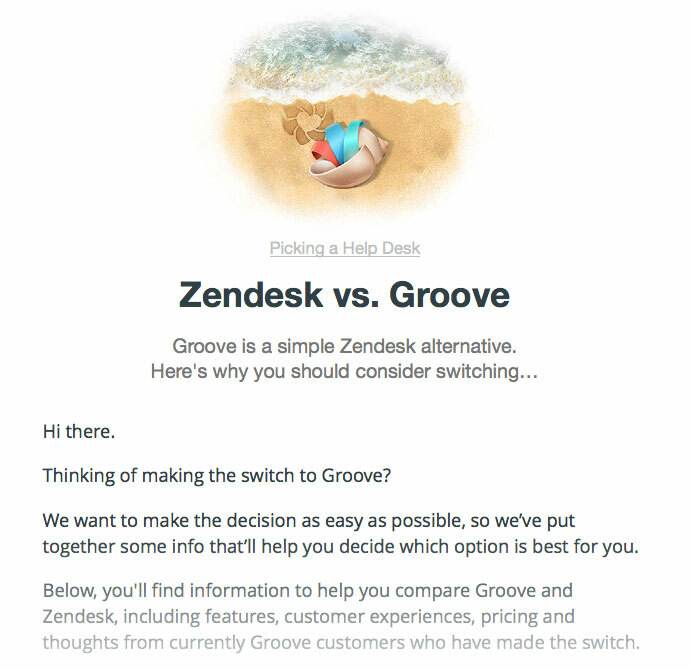 Many of the people who end up signing up for Groove come from other services like Zendesk, Desk.com and even Gmail. These pages have generated not-insignificant traffic (in the low five figures) that’s highly targeted and converts at impressive rates compared to regular site visitors. Takeaway: Look for opportunities to capitalize on the non-obvious things that people might be searching for. Take the time to build landing pages that speak directly to the users of your competitors’ products. Other landing pages you might want to build include feature-specific landing pages (if many of your customers are looking for a particular feature), persona-specific landing pages (for example, some of our customers search for “best help desk for ecommerce businesses”), and integration-specific landing pages (e.g., “best Slack integrations”). While we’ve continued to spend some time building integrations, as I mentioned, it’s a pursuit that we unfortunately don’t have as much time as we’d like for… yet. We’ve released an open API that allows developers to build integrations with Groove, and we’ve worked *really *hard to help promote those companies that do end up building Groove integrations. We want to make it incredibly attractive to be a Groove partner. We’ve built a Zapier integration to make it easy for anyone to integrate Groove with their other favorite apps, even if they don’t know how to code. 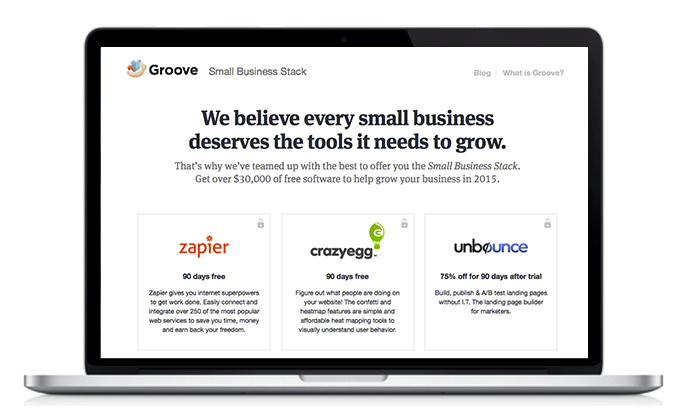 We released the Small Business Stack. Our goal was to help small businesses get access to business apps that they otherwise might not be able to afford, and while not exactly an integration partnership, many of the benefits we’ve gotten from it have been similar: our SBS partners have helped us promote the Stack, and in turn, driven traffic to Groove. All in all, we’ve helped more than 6,000 businesses get access to $30,000+ in free software. Takeaway: While third-party integrations can be incredibly valuable, you may not have the resources to build many of them in the early days, and that’s okay. Look for other ways to leverage partnerships that might have more exponential returns, like building an open API or getting creative about how you build marketing partnerships. The title of this post wasn’t meant to belittle the value of advertising. In fact, advertising is one of the most effective ways to drive traffic, and it’s something we’re experimenting with right now. But we haven’t always had the budget for paid traffic. And we still needed to get visitors, or go out of business. I hope that the strategies in this post help you take a smart look at your own traffic strategy, and think about the steps you can take to start driving hundreds, if not thousands of times as many visitors as you’re getting today.